About Company : When you choose Tata Consultancy Services (TCS) as your IT services, consulting and business solutions partner, you will discover what so many global enterprises have already discovered—the power of certainty. About Company : We are one of the world’s leading organizations providing management consulting, technology and outsourcing services, with approximately 275,000 employees; offices and operations in more than 200 cities in 54 countries; and net revenues of $28.6 billion for fiscal 2013. 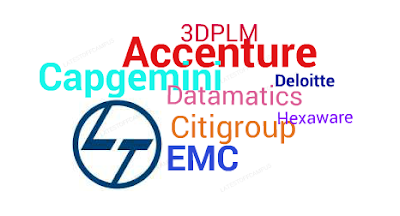 About Company : Tech Mahindra is part of the USD 16.2 billion Mahindra Group and is a leading global systems integrator and business transformation consulting organization, focused primarily on the telecommunications industry. About Company : L&T Infotech is a global IT services and solutions provider. We provide the winning edge to our clients by leveraging our Business-to-IT Connect and deeply committed people. About Company : IBM is a technology company which offers hardware, software and services in Information technology sector. It is operating in India for past 20 years having presence in more than 200 cities in India. About Company : Founded in 1976, HCL Infosystems Ltd has established itself as India´s premier hardware, services and ICT systems integration company offering a wide spectrum of products which include - Computing, Storage, Networking, Security, Telecom, Imaging and Retail. Over the years, we have developed specialized expertise across verticals including Telecom, BFSI, e-Governance and Power. About Company : Infotech Enterprises provides leading-edge engineering solutions, including product development and life-cycle support, process, network and content engineering to major organizations worldwide. With over two decades of continuous growth, Infotech leverages a global delivery and collaborative engineering model to achieve measurable and substantial benefits for our clients. Whether your organization needs to design innovative products faster, optimize R&D costs, increase market share, enhance operational efficiency or maximize the return on investment in your networks, Infotech Enterprises is the ideal partner.